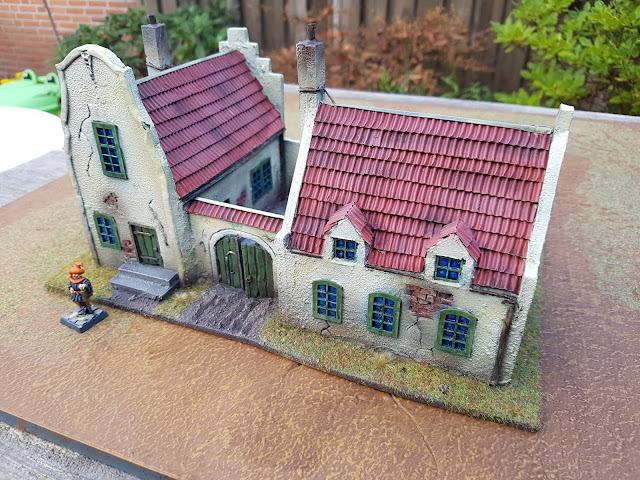 Yesterday I managed to complete the paintwork on my veerhuis (ferry house). As per usual with an overtly documented project like this, I forgot to take in-between pictures as I got carried away painting. Maybe during the next project I'll remember to snap photos as I paint. I have more MDF bases lined up, so I might continue with this village. To start with this house, here's the end result. (For people interested in the construction see post 1, post 2 and post 3). Now there is a lived in house ready to be fought over. 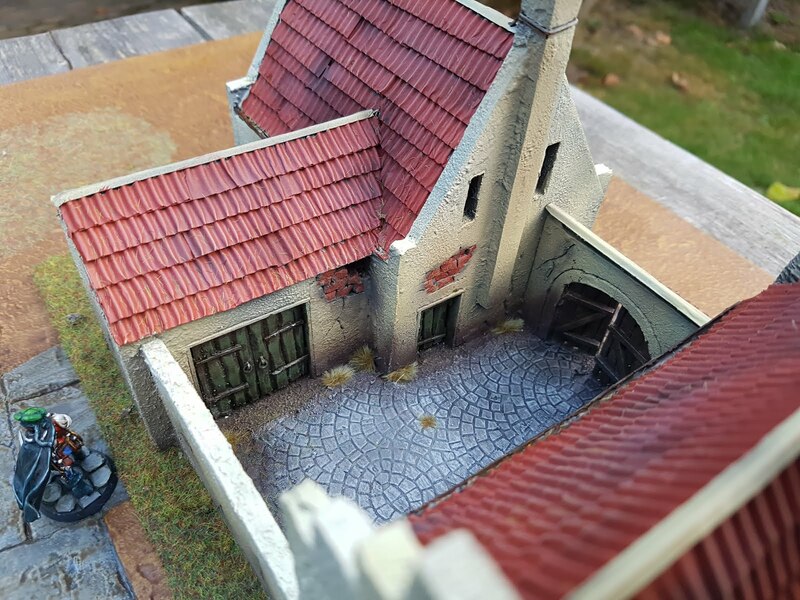 This was a fun project to paint, I especially liked working the dry-, air- and regular brush on the roof tiles to make them look nice and weathered. The chimneys actually had to be toned down as I got too carried away applying sooth there. I put the old wizard out in front of the house to give a bit of extra scale to the whole endeavor. Lets do two quick in-between snaps (the only two I have). Add primer (and backlight) and all your sins and mistakes seem to disappear. I started out with a serious base coat of Vallejo German Grey primer. I took special care to hit every nook and crevice to make sure anything I fail to hit with a paint brush is black(ish) when the paint job is finished. Add paint and they're all back again. Second step was applying a base color of Vallejo Game Color (VGC) Dead Flesh on all the walls. This has just the right amount of yellow/white to work for my purposes. I then applied Vallejo Game Color Khaki to (to be) shaded areas and Vallejo Model Color (VMC) Aged White as a highlight to most of the walls. Now that guy looks like he's up to no good. Next up where the roof tiles and the cracks in the walls. 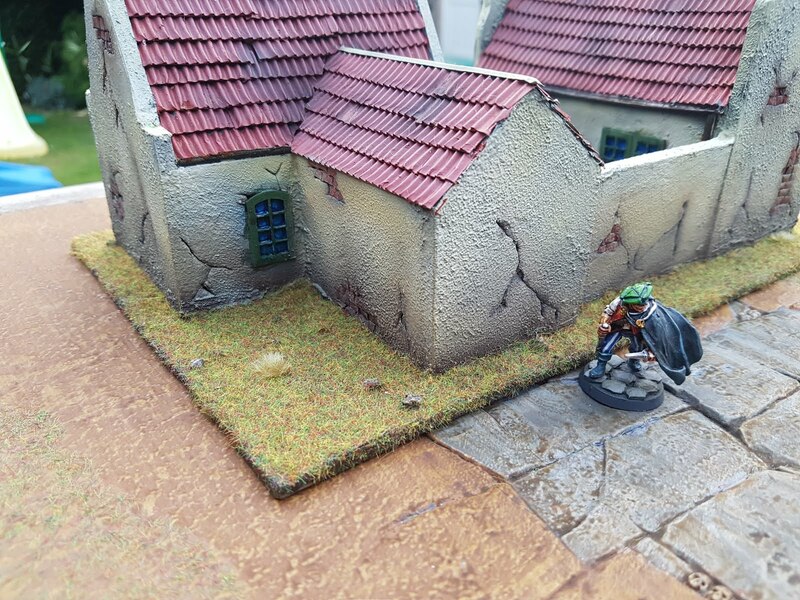 I painted the roof tiles with VMC Cavalry Brown using a paint brush so I wouldn't hit the walls. I then applied a VMC Stonewall Grey to all the cracks and exposed brickwork in the wall sections. I used a q-tip to take off excess paint on the cracks while the paint was still wet. I wanted to add more color to the courtyard, but I think it still worked out like this. The inner courtyard was painted with a mix of VMC Stonewall Grey and VMC Anthracite. Then I washed it rather heavily with the large tub of black wash by Vallejo. After it had dried I drybrushed it with Stormvermin Fur and finally a bit of Celestra Grey (both GW colors). I tried washing a few tiles with Flesh Wash, but in the end it didn't really show up on my end result (and I was too lazy to start painting individual paving stones). Who left the gate open? The inner courtyard doors and windows gave me the hardest time as I couldn't quite fit my brush between the buildings. The biggest trouble painting this house overall turned out to be the windows. I decided I wanted them to look like the paint was old, off-white and cracked. I took out my tub of light crackle effect by AK Interactive and used that on all the windows. It failed to crack almost everywhere. In the end I ended up mixing some grey with VGC Heavy Green and repainting all the wooden surfaces a very acceptable weathered Dutch green. I then washed them all with Athonian Camoshade by GW. The window panes where painted a dark blue, then I dashed the center with a light blue. When this had dried I sploshed in some Tamiya Clear Blue. 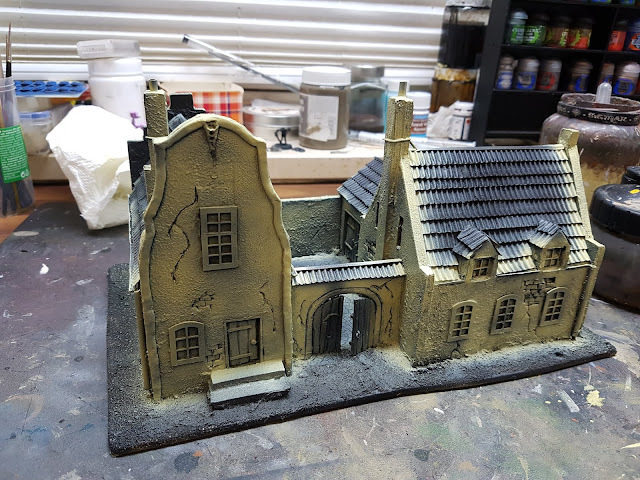 Not mentioned in the text, I lightly airbrushed a black wash along all the bottom walls to tie the building in with the base. The bricks where painted the same Cavalry Brown as the roof. 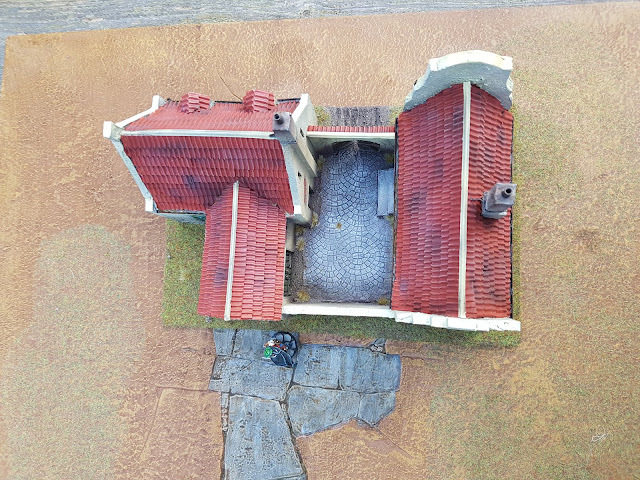 I then drybrushed both the base and the brick with GW Talarn Sand and Karak Stone. The roof itself was carefully airbrushed in patches with Vallejo Black wash and a few very thinned down (random) greys (leftover courtyard paint). 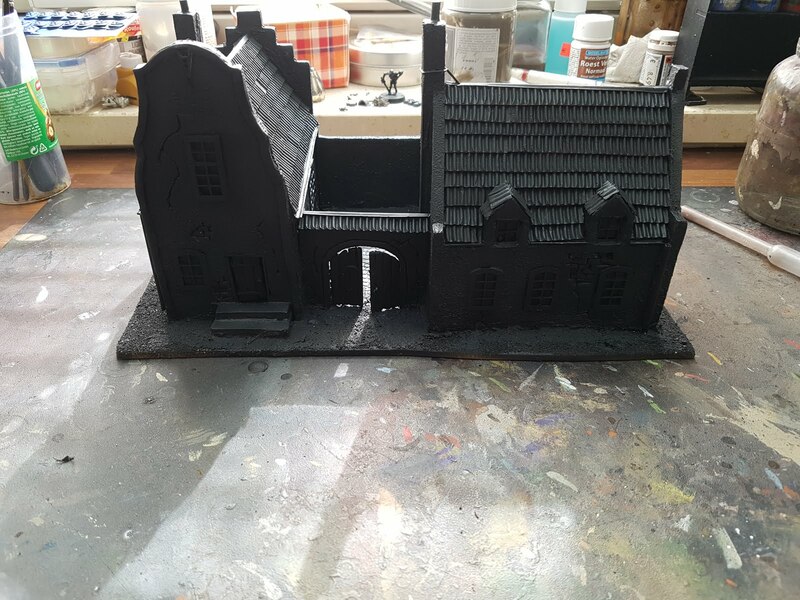 I also lightly drybrushed the roof with Talarn and Karak to tie the whole model together. 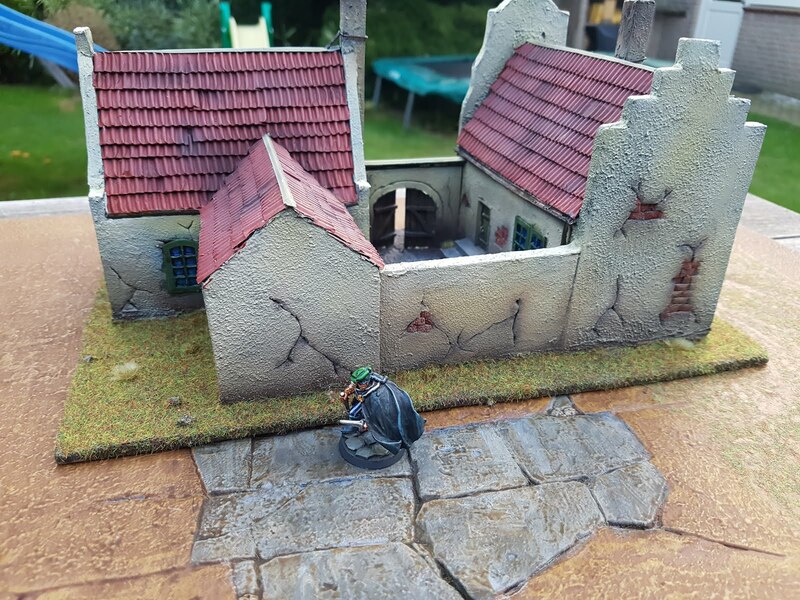 And a final shot of the courtyard and the stable doors. And as a final shot a side by side of the inspiration and the final project. Not one on one, but close enough for my taste. Now on to more buildings (or a different distraction). Awesome work, this turned out beautifully! I hope you do get round to a whole village at some point. Cheers, I'll keep working on more buildings for now. I'm going to be starting up my "Better Know a Blogger" series again. Any interest in taking part? I would love to. I've send you an email on the address mentioned on your blog. Turned out very nicely indeed. How big is that courtyard? ~80x120? Is there enough room to put a regiment in there for defense? Thanks. 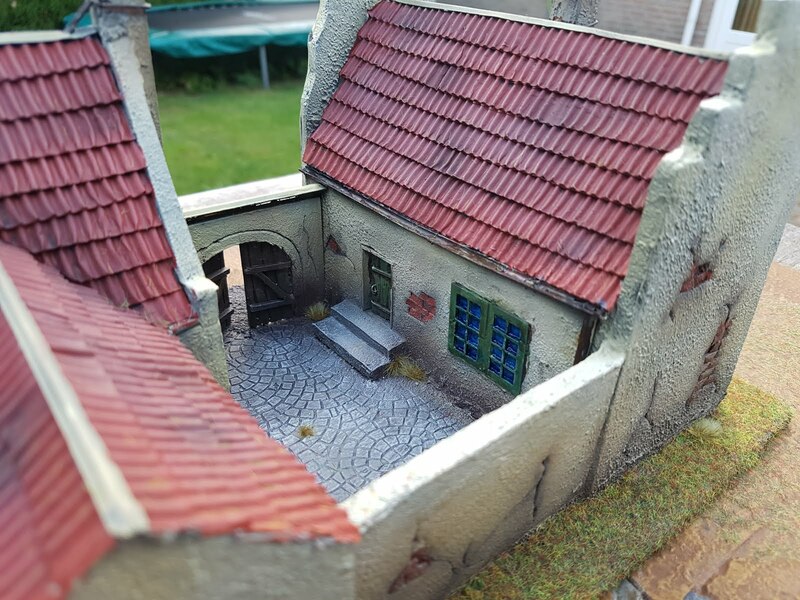 The courtyard is 18cm (7") long and is 6.5cm (2.5") at its smallest and 8cm (3.1") at its widest bit. A small group could defend it. Never considered it to be honest, good point to take with me on a follow-up build.